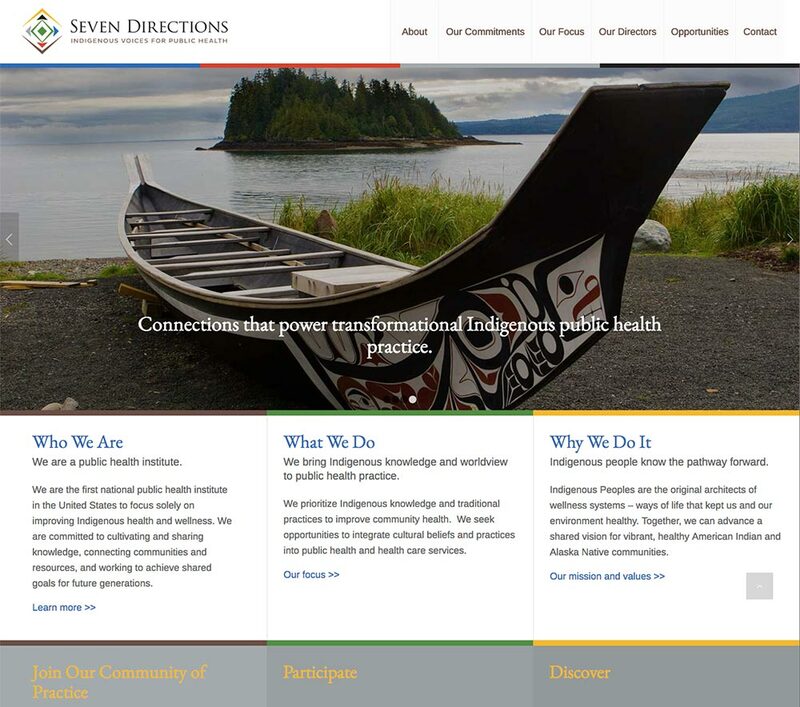 Seven Directions is an emergent Indigenous public health organization/practice that has its roots in First Nation practices. It honors, seeks and shares Indigenous knowledge with others, fosters relationship-building, contributes to innovation and creativity within the public health field, seeks opportunities to understand more deeply what will improve Indigenous health and uses resources such as models, tools, and information to accomplish its goals. “Seven Directions was born from a desire to create greater connectivity across the many tribes, communities and organizations that have the health and wellness of American Indian and Alaska Native people at the heart of what they do. With support from a grant from the Robert Wood Johnson Foundation, Red Star International, Inc. led an exploration began in 2011 to determine the value and desirability of an Indigenous focused public health institute (PHI). The exploration was guided by a national advisory board, and included strong Tribal engagement and outreach, coupled with a public health systems analysis and financial review. After numerous roundtables, presentations and forums, the national advisory board concluded that an Indigenous PHI was feasible, and was greatly needed to create sustainable, systemic change to improve health outcomes in our communities. In August 2016, with support from a grant from the W.K. Kellogg Foundation, Seven Directions emerged as the first national public health institute (PHI) in the United States to focus solely on Indigenous health and wellness. Simply put, the opportunity to work on this on this web design and development project was a great honor to us. The integrity of the organization lives with absolute authenticity through and through. In every aspect of the process there was deep abiding respect for the work and all the people involved. We had the pleasure of working directly with the Seven Directions Founder, Aleena Kawe and Keisha Musonda, MPH as well as Linda Spencer, a strategic communications specialist. Linda’s thirty plus years of experience working with diverse programs both nationally and internationally informs her ability to craft culturally sensitive messaging of authenticity and intention.